Lehman College President College José Luis Cruz recently appeared on the award-winning television series EdCast, and his compelling interviewing will air on CUNY-TV and be available on the web. • Wednesday, January 18 at 10:00 a.m.; 3:00 p.m.; and 11:00 p.m.
• Saturday, January 21 at 8:00 p.m.
• Sunday, January 22 at 10:00 a.m.
• Wednesday, January 25 at 10:30 a.m.; 3:30 p.m.; 11:30 p.m.
• Saturday, January 28 at 3:00 p.m. The show is entitled “Meeting the Future with Intentionality and Purpose: An Interview with Lehman College’s new President José Luis Cruz.” During the interview, Cruz discusses his vision for Lehman and the implication of changes in national leadership. He shares his views on what makes for successful institutions, and how Lehman can best serve its students and community in a time of increasing technological innovation and political uncertainty. 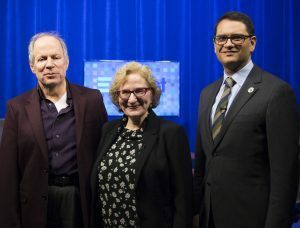 EdCast, an award-winning Lehman Studios production now in its 9th year, is hosted by Dr. Linda Hirsch, a professor of English at Hostos Community College. The executive producer for EdCast is Jerry Barnard and the production is recorded at Lehman Studios and on location in cooperation with BronxNet. The program’s most recent guest was New York City Schools Chancellor Carmen Fariña. The Chancellor shared her thoughts on numerous educational issues such as, effective pedagogies, the status of teachers today, professional development, and the implications of the presidential election on education.